THE FATAL CARESS...and other accounts of English murders from 1551 to 1888. 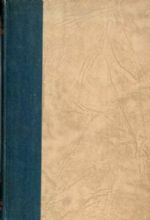 Hardback, 1st US edn. Preface by Anthony Boucher. Pp. 163-209 incl. 'The Jack-the-Ripper Murders 1888' (from 'The Times', 1888). With 28 other cases 'which have hitherto received little attention from anthologists and chroniclers of crime.' With Bibliog. 210pp. 8vo. h/back. From the library of true crime writer, Wilfred Gregg, with his personal b/plate. Vg.